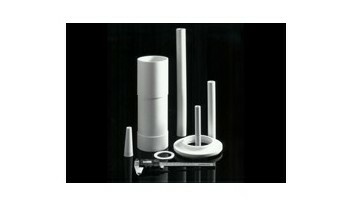 Ceramic Insulators – LSP Industrial Ceramics, Inc. The most easily recognizable ceramic insulators can be found at power substations and on electrical transformers suspended from utility poles. They are called bushings and are usually designed with several conic or circular tiers stacked on top of each other. These tiers are designed to keep water as far away from the center of the bushing as possible; this reduces the number of avenues by which electricity could be conducted in the case of a bushing puncture or fracture. In the context of thermal insulation, ceramic insulators are used to help maintain the temperatures of industrial ovens, art studio kilns and many other kinds of heat-generating equipment. This improves heating process efficiency while simultaneously preventing the unwanted transmission of heat, often in unsafe degrees, into workspaces. Ceramics are often good choices for heat and electrical insulation because of the electrical and thermal non-conductivity of some ceramic varieties. Ceramics are versatile materials and can be shaped into solid insulation of any shape. Ceramic fibers can also be spun into high temperature insulation “wool.” Ceramic wool is an excellent insulator because it is easily placed around heating enclosures and prevents heat from escaping. Ceramics vary in their electrical and thermal conductivity. Aluminum nitride and silicon carbide, for example, conduct heat well, which does not make them suitable thermal insulators. If either material was used to insulate a heating enclosure, heat generated in the enclosure would be transferred quickly to the insulation and then transferred again to the area outside of the enclosure. Aluminum oxide ceramics are fair thermal insulators and are most effectively employed in low-heat insulation applications. Silicon nitride is better still as an insulator and zirconia is among the most effective ceramic insulators, transmitting very low levels of heat between itself and heating enclosures. Another important property of ceramics related to their capacity as insulators is their low thermal shock susceptibility. Thermal shock susceptibility is the tendency of a material to become damaged when exposed to frequently or quickly changing temperatures. Most ceramics are very thermal shock-resistant. 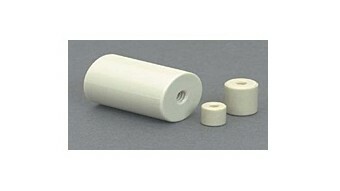 Ceramic Insulators Ceramic insulators are ceramic materials used to insulate electrically-conductive materials or temperature-controlled enclosures. In the context of electrical insulation, ceramic insulators are usually limited to the insulation of electrically conductive materials on an industrial or municipal scale.